Scott Kelby ruined my photos. His latest book was just released and within the first few pages I found a tip that would have saved a shoot from a couple of months ago. If he’d been faster and gotten his book out sooner, my photos would have turned out much better. Curse you, Scott Kelby. Curse you! I refer of course to “The Digital Photography Book – Part 4” the, well, 4th volume in his series. Written as a continuation of parts 1-3 (previously called “volumes”, which I think people confused with “editions”), the book like Alpo offers pure meat with no cereal fillers. It’s simply short quick tips, not overladen with technical hows or whys and with absolutely no humor (well, because it’s Kelby you know there is going to be humor). As the author puts it, he wrote it like he’s talking to you right there, on a shoot. Each page of the book’s eleven chapters contains a single concept that Kelby explains with the right amount of detail resulting in several head slapping, “Why didn’t I think of that!” moments. Also scattered throughout the book are full color photos including the shooting specs for each. Topics covered include: shooting people (with a camera), using your hot shoe flash, lens selection, as well as chapters on landscape, sports, and nature photography. The author refers back to topics covered in the previous volumes, so you would definitely want to consider adding the entire set – and future volumes as photographic wisdom filters through the mind of Scott Kelby and he shares even more with the rest of us. 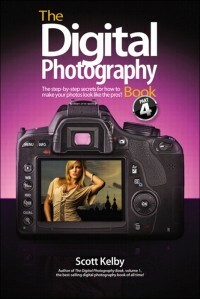 “The Digital Photography Book – Part 4” by Scott Kelby is from Peachpit Press and retails for $24.99 and is available from Amazon.com or readable online via Creative Edge. This entry was posted in Books, Reviews and tagged book review, peachpit press, scott kelby. Bookmark the permalink.